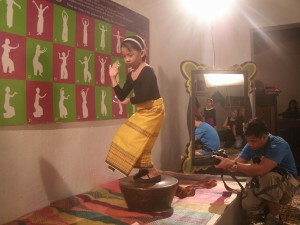 On 7 May 2013, the children of the AlunAlun Dance Circle went to Museo Pambata Boulevard, Manila to dance pangalay and be documented on film. 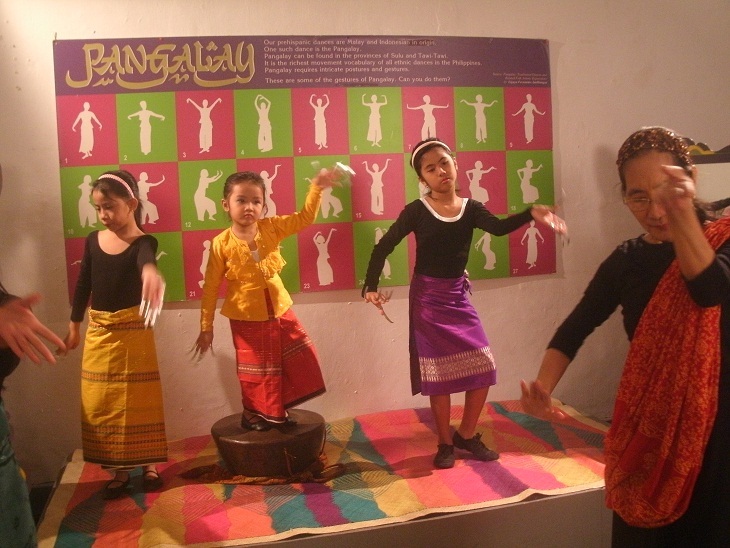 The project is in cooperation with the NCCA and Museo Pambata, where Ligaya Amilbangsa’s pangalay silhouettes depicting various pangalay postures and gestures are displayed at the Karapatan Hall of the children’s museum. 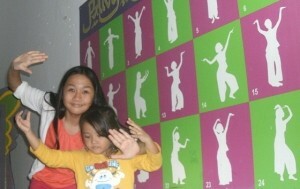 The children who all danced solo atop an agung were Roni Matilac—8 years old, Careema Wadi—7 years old, Hannah Wadi—5 years old. 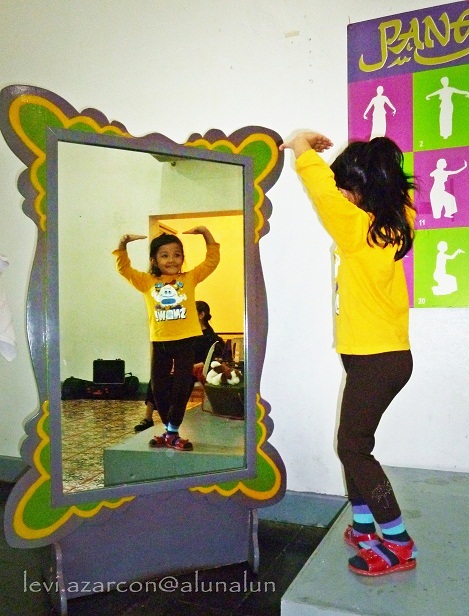 Meanwhile, Gemely Amar, 15, who started pangalay training when she was only 3 years old, danced the igal kabkab which is an original choreography of pangalay using a fan created by Ligaya Amilbangsa. 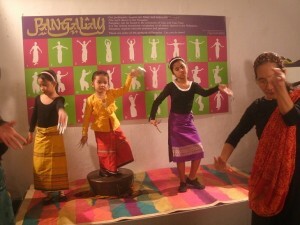 The digital film documentation of children dancing pangalay will be part of a film supported by the National Commission for Culture and the Arts in 2013. The film with the working title of “Pagbabalik sa Tawitawi” traces the journey of Ligaya Amilbangsa in documenting and preserving the traditional dances and related artistic expressions of the Sulu Archipelago from the 1960s until the present. 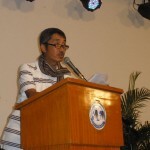 The documentary film is written and directed by Nannette Matilac, ADC Managing Director. 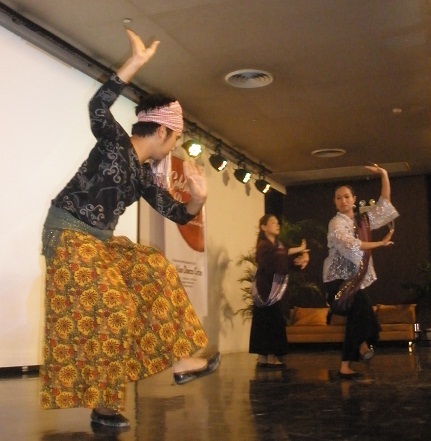 On 8 March 2013, coinciding on International Women’s Day and in post-celebration of the National Arts Month, the students of classes under Prof. Bani Ambion in the Malayan Colleges Laguna hosted the AlunAlun Dance Circlefor a dance lecture and film showing entitled Celebrating Pangalay at the Francisco Balagtas Auditorium in the Laguna campus from 10AM to 12 NN. 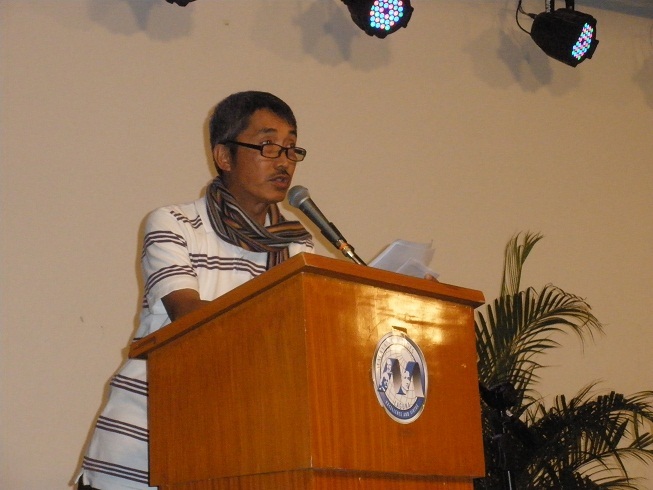 Celebrating Pangalay was organized by Prof. Bani Ambion with the overwhelming support of the students. Dean Joy Hofileña who gave an inspirational talk after the opening remarks by Ms. Maria Rovilla stayed through the two-hour celebration to watch the film showing and enjoy the lecture performance. 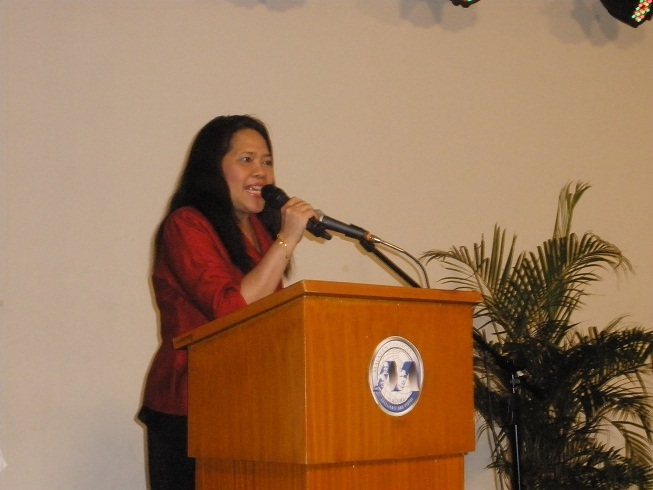 Dean Joy Hofileña who gave an inspirational talk after the opening remarks by Ms. Maria Rovilla stayed through the two-hour celebration to watch the film showing and enjoy the lecture performance. Preceding the pangalay lecture performance was the film showing of “Sayaw sa Alon” (Dancing on Waves). 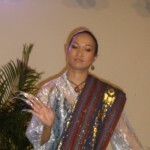 Written and directed by Nannette Matilac, the documentary film “Sayaw sa Alon” started in 2005 and was completed in 2008. The film won Best Director and Best Cinematography in the 5th Moonrise Environmental Film Festival. The film has been shown in Japan as one of the finalist of the 17th Tokyo Earth Vision Global Environmental Film Festival and was subsequently chosen as one of the Best of Tokyo Earth Vision in 2009. “Sayaw sa Alon” (Dancing on Waves) is a journey into the life and culture of an endangered people, the Sama Dilaut also known as the Badjao (Bajau), whose cultural demise will be a great loss to humanity itself. 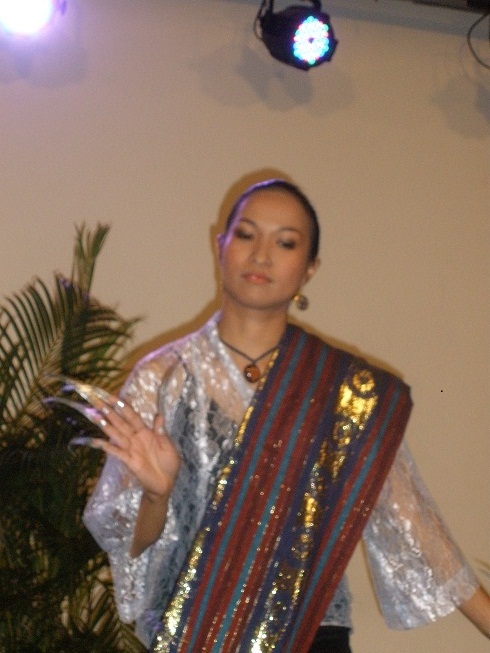 Also called sea gypsies, they are one of the ethnic groups inSouthern Philippines wherein pangalay dance style originates. 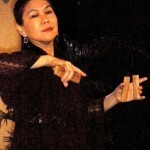 Angeles, Louanne Mae Calipayan and Nannette Matilac presented a lecture demonstration on the pangalay dance style featuring linggisan (bird dance), tariray (dance with bamboo clappers) and tauti (mimetic dance on catching cat fish). 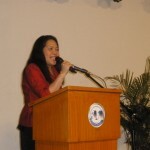 The film showing and the performance was followed by an open forum moderated by Ms. Sheryl Hermosa.